Oh me, oh my! How lucky I am to find this beautiful tiger of a pen: the Pilot Metropolitan fountain pen. I went on a visit to a pen shop as I hadn’t been there for a long time, and I really hadn’t planned to buy anything at all that day. But well, maybe my subconscious had actually thought, “How nice it would be to buy a nice, new, inexpensive fountain pen, eh? How about that?” so when I browsed up till the Pilot section of the shop, this nice little pen totally caught my attention. I had to request to touch and feel it. Actually, up to this point, I hadn’t imagined what the price of this pen would be like, as it looked moderately premium and felt pretty solid and decent in the hand. When I flipped the price tag over, I was stunned. It was just a mere twenty-odd Singapore dollars! How can this pen pop up just like that, how can it read my subconscious mind, knowing that I wanted a nice, new, inexpensive fountain pen? How? I actually hesitated for a moment before getting this pen. I set it back down on the glass display top, and stared for a long time at its other-coloured counterparts. There are Purple Leopards, Brown Snakes, and this one and only White Tiger. Then there are other non-animal prints like dots, circles and all that. Seeing how the White Tiger seemed to be the most unique pen in the display case, I decided to pick that design. Another important reason is that I really like white pens. I guess at that time, there was no better choice! The next step was to decide on the type of nib. The sections of the Pilot Metropolitan are all the same black type, so I could really choose any available nib (plus section) I wanted. The White Tiger originally came with an M nib. Then I noticed that another pen comes with an F nib, and I thought I should just get that one. Finally, as this pen came out of the box with a CON-20 converter which I really dislike, I got a CON-50 one to go with it. I like how the nib is tapered gradually so the overall nib part is long and sharp. The design on it is really simple: it has the words “Pilot <F> Japan” to indicate the brand and the nib size, and a series of parallel strokes in threes along the two tapered sides of the nib point. Even though simple, it gives a little bit of character to the nib. Being a Japanese F nib, the line that comes out of the pen feels more like an EF. It is somewhat scratchy sometimes, I’m not sure why. I suppose it is because of dust and other gunk being trapped in between the tines. Out of the box, the nib actually doesn’t feel all that much scratchy, although there is some feedback. It is not easy to get very fine nibs to be very smooth. Pilot Metropolitan, with an F nib and Aurora Blue ink. For me, F or EF nibs are good for writing not too quickly or heavily, as brisk and firm strokes increase the amount of feedback and scratchiness you will experience. These may be good for casual writing, drawing or sketching. I wouldn’t use this for signing either, as I like my signature to have thick lines made by a B nib or an italic or oblique nib. Also I tend to sign quickly, so the quick strokes won’t be comfortable with a needle-like point like an F or EF. The pen body is slightly tapered at both ends, the thickest point being somewhere around the middle, where the cap opening is. It is overall medium-light – not heavy at all, but not too light either. It is middle-heavy and the cap comes off by pulling and not twisting. If you post the pen, the weight of the cap is added on to the top end of the pen and kind of balances the weight distribution across the whole body. I’m not crazy about posting caps, so I don’t, and personally I am comfortable with the weight being more concentrated in the middle of the pen. There is also a strip of design running around the middle of the pen, where the cap ends and the body starts. 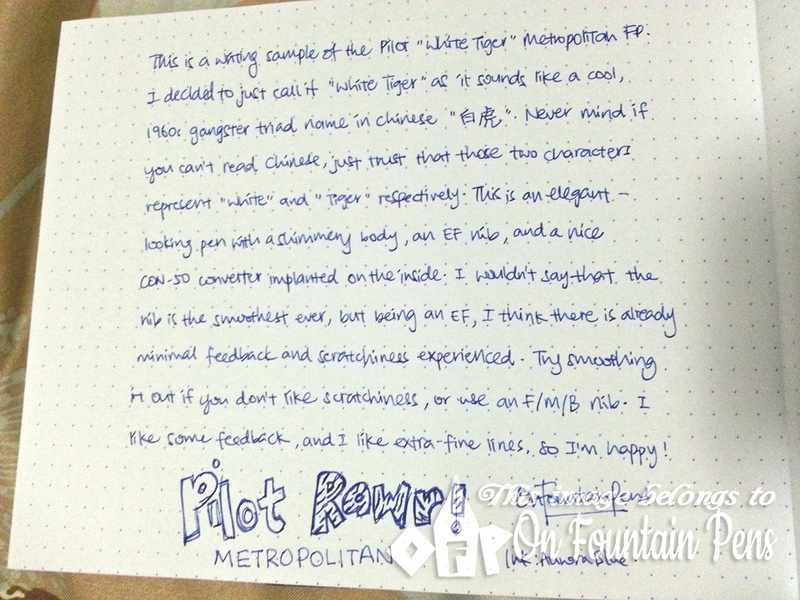 On my Pilot Metropolitan, the design is of grey tiger stripes, that’s why I call it the “White Tiger”! 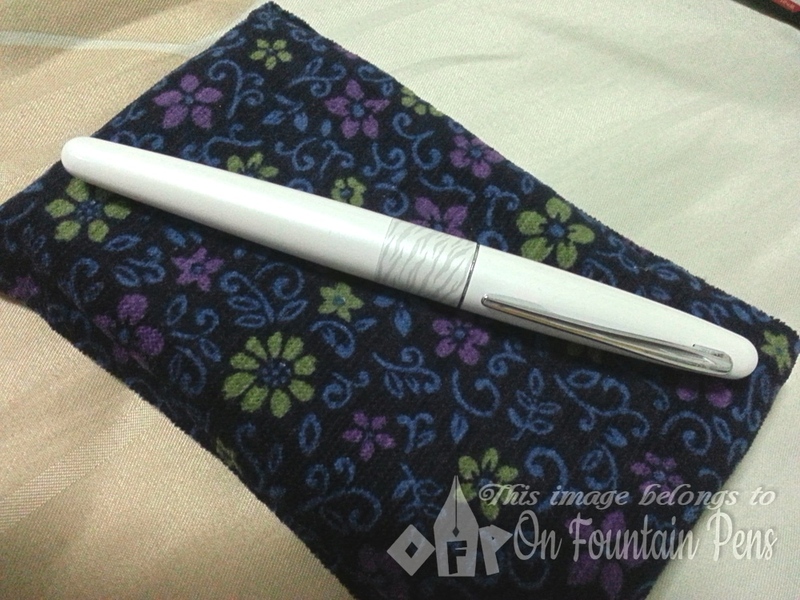 This is a nice and elegant pen which is very worth its price. I do encourage everyone to get a pen like this. This will make a very good beginner’s pen as well, due to its low cost. I bought a “retro edition” Metropolitan in green at Staples. I was not planning to buy a pen that day but the price and appearance were too much to resist. I was amazed that a pen of this quality only cost me twenty dollars. Very well made and very attractiive. Just as good as a Kaweco sport. Mine is a fine nib and although I prefer a medium this one writes well and is not that scratchy. Nice review and what a gem! I love the Pilot Metropolitan! It’s really good for an inexpensive pen. Great pen! I’ve recently become a Metro fan and plan on getting the “White Tigerrrrr” for a friend who’s just the perfect recipient for that pen, so thanks for the great pics (mine is “Plain Black”). Mine (also ) had also a bit of feedback, but after a few figure 8′s on mylar abrasive it is now super-smooth! What a pen – for any price, but for this little?!? Looks like you got yourself a real bargain there, Maybelline!